Summary BYOD single bay Mindspeed-powered SATA NAS with Gigabit LAN, USB 3.0 and eSATA ports. Many NAS manufacturers use a common operating system across their entire product line. If you're looking for a low cost single drive NAS, that's good news. With a common operating system, you get most, if not all the features of a manufacturer's far more expensive NASes. Of course, with a single drive NAS, you won't get the fault tolerance provided by RAID. Earlier this year, we reviewed the QNAP TS-112P single drive Turbo NAS. Using QNAP's category description, the TS-x12P is aimed at the SOHO/Home (entry level) market. This review will focus on the single drive TS-131 Turbo NAS, a member of the Work Group/SOHO/Home category (middle-end) NASes. Compared to the TS-112P, the TS-131 represents a significant step up in performance and features for $40 more than the TS-112P. The TS-131 has a hot-swappable, removable tray that supports both 3.5" and 2.5" disks, dual-core processor with support for hardware encryption, three USB 3.0 ports and can act as a domain controller. 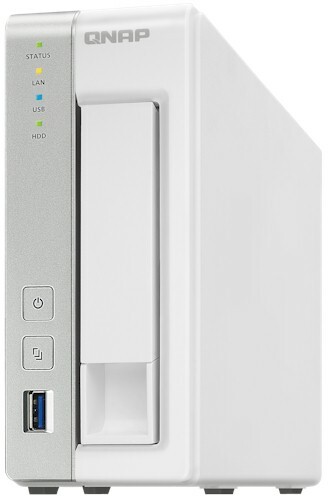 The TS-112P doesn't have a removable drive tray, supports only 3.5" disks, has a single core Marvell processor and two USB 3.0 and 1 USB 2.0 ports. And, as we'll see in the performance section of this review, the TS-131 provides quite a bump in performance. QNAP uses common instruction manuals that cover multiple products. I wasn't able to find callouts for the front and rear panels, but both are simple enough that you can easily identify the LED indicators and the ports in the panel views below. The front panel has indicators for Status, LAN, USB and HDD. There's a single USB 3.0 port, a USB copy button, and the power switch. Unlike the TS-112P, there's not a status light for eSATA. The rear panel has a single Gigabit Ethernet port, two USB 3.0 ports, eSATA port, power connector and a Kensington security slot. Cooling is provided by a 5cm fan. In the upper left corner you can see, from the top moving toward the bottom, the power connector, eSATA port, the two USB 3.0 ports and the Gigabit Ethernet port. To the right of the ports is the eSATA connector that connects to the disk. Along the lower right edge of the PCB are the LED indicators. Table 1 shows a comparison of key components for the TS-131 as well as the other two single bay NASes I'll be using for comparison in the performance section of this review. Testing was done with one of our WD Red 3 TB (WD30EFRX) drives. With the drive spun up, the total power consumption was 10 W. The power consumption dropped to 6 W with the drives spun down. Noise was rated Very Low.